Table bookings are now open for the annual AV Technology Awards, and early-bird pricing is available until April 22. 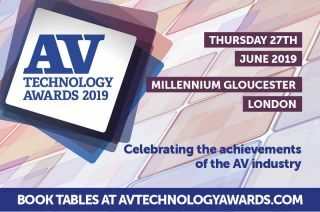 The award ceremony—hosted by Installation and AV Technology Europe—will be held on June 27 at the Millennium Gloucester in London. "The AV Technology Awards debuts this year, bringing a combination of the prestige the Install Awards has built up over half a decade, with the excitement that was generated by the inaugural AV Technology Europe Awards, which was held during ISE last year," said Jo Ruddock, group editor, Installation and AV Technology Europe. "The aim of this combined and restructured event is to hit every part of the AV industry and provide an opportunity for integrators, end users, manufacturers, and distributors to all celebrate their successes together," she added. Awards like Visitor Attraction Project of the Year, Industry Newcomer of the Year, Collaboration Product of the Year, and more will be announced at the event. For more information or to register, visit www.avtechnologyawards.com.